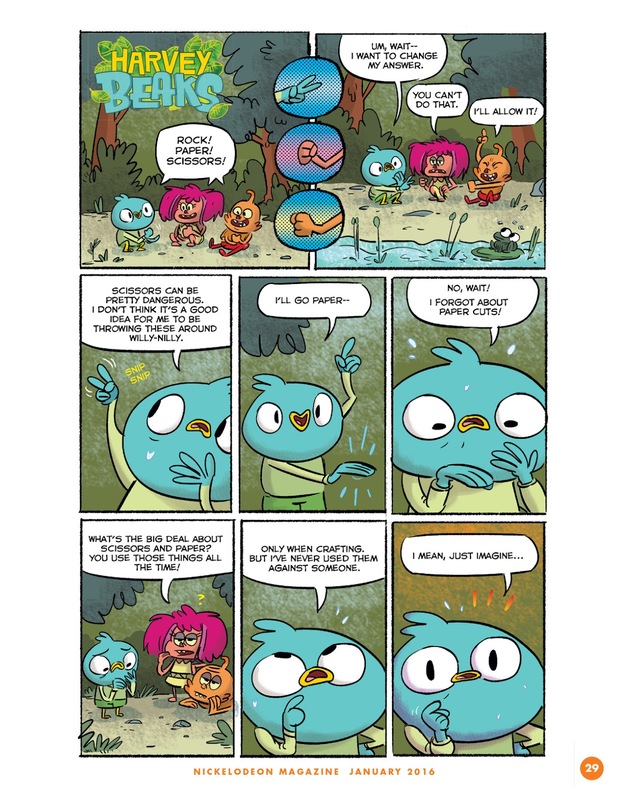 "Is there going to be new episodes of Harvey Beaks next month?" 2016 On Nickelodeon UK, NickToons, And Nick Jr.
"WITs Academy" is a bewitching spin-off from "Every Witch Way" that follows Andi's magical journey at the prestigious W.I.Ts Academy. 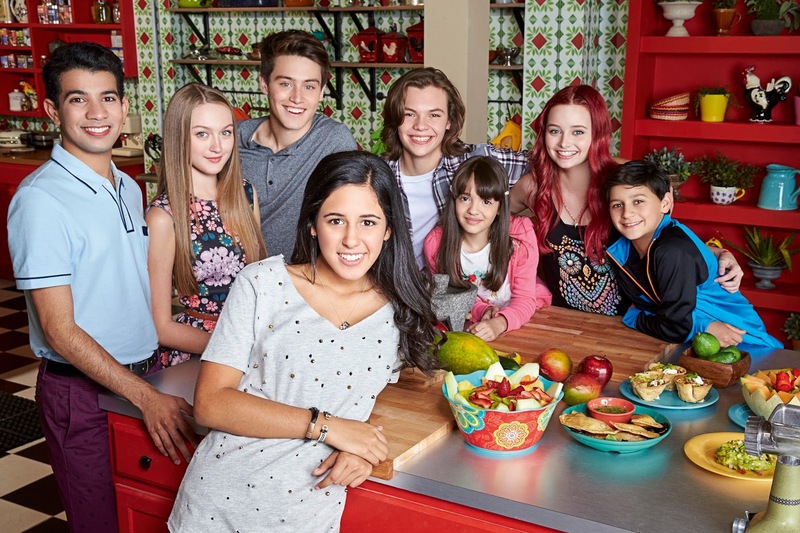 Inspired by the daily telenovela format, Nickelodeon's all-new live-action series "Talia in the Kitchen" centres on 14-year-old Talia, a aspiring chef who moves in with her grandmother and starts spending time in the kitchen of their family-owned restaurant, where she discovers her true calling: cooking. With the help of her special "salt and pepper sense" - and her late father's magical spices - Talia is able to infuse emotion into her food to whip up some truly life changing cuisine and cook just what each customer needs. She's making magic in the kitchen! "Talia in the Kitchen" stars Maria Quezada as Talia Parra, Miguel Luciano as Frenchie, Gail Soltys as Debbie, Liam Obergfoll as Tyson, Josh Hoffman as Rudy, Galilea La Salvia as Julie, and Ellis Ann Jackson as Valerie. "Talia in the Kitchen" (20 half-hour episodes) was created by Catharina Ledeboer, filmed in Miami, Florida and produced by Nickelodeon Latin America, the team also behind "Every Witch Way". "The Ludwigs" is a brand-new series that follows the comedic adventures of five foster children who are on a quest to find out what happened to their foster parents, Mr. and Mrs. Ludwig, after they mysteriously disappear. While they work to unravel the mystery, the kids must keep up appearances that everything's fine at home, and fend off the Ludwig's greedy and duplicitous heirs. "Diary of a Snob" is a brand-new series based on the tenth and eleventh books from columnist, author and broadcaster Grace Dent! The pilot was filmed in the UK and was produced by Buccaneer Media for Nickelodeon and directed by Dominic Brigstocke ("I'm Alan Partridge", "Smack the Pony"), with Charles Harrison serving as Producer, Susannah Binding as Script Supervisor, Helen Woolfenden as Costume Designer and Tim Dickel as Production Designer. 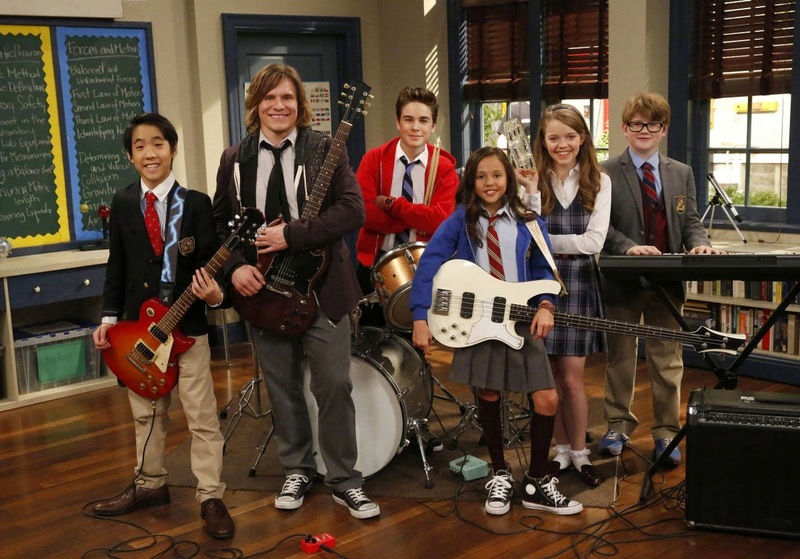 Inspired by the hit movie of the same name, "School of Rock" follows a unique group of prep school students who are in for the change of a lifetime when a down-on-his-luck musician poses as their substitute teacher. At first, the overachieving and rule-following kids are rather unimpressed, but their new teacher, Dewey, uses rock n' roll to ignite their inner expression. "School of Rock" stars Tony Cavalero (Nickelodeon's "Splitting Adam") as "Dewey", Ricardo Hurtado as "Freddy", Lance Lim ("Growing Up Fisher") as "Zack", Aidan Miner (Nickelodeon Creative Lab's "Homeroom") as "Lawrence", Jade Pettyjohn (Nickelodeon's "Henry Danger") as "Summer", and Breanna Yde (Nickelodeon's "The Haunted Hathaways") as "Tomika". Nickelodeon UK will conclude the brand new seventh season of the popular animated television series "Winx Club" in January 2016! Get ready for more massive performances, the biggest celebrities and more slime than ever in the biggest party on the planet, the Nickelodeon Kids' Choice Awards 2016, hosted by country music superstar Blake Shelton, direct from Los Angeles, California! The UK version of KCA 2016 is sponsored by children's skate-shoe brand Heelys and new movie, "Kung Fu Panda 3", in cinemas Friday 11th March 2016! What if your dog became a dude? Manny is about to live the tail! In Nickelodeon's brand-new original television movie, Manny has moved to a new school, and is finding it hard to fit in. After wishing he had more friends, Manny finds a mysterious collar and puts it on his loyal dog, Rufus. Suddenly, Rufus is magically transformed into a real boy! Manny's not sure what to do, so he enrolls Rufus in school. Quickly, Manny learns that having a dog-turned-dude by your side is pretty awesome, but it's no walk in the park, either. When the other students notice Rufus's silly dog antics - chasing squirrels, eating without utensils, asking for belly rubs, and catching soccer balls and flying discs with his mouth - he immediately earns school-wide pup-ularity. Manny is jealous of his new best friend but eventually leans that a dog's loyalty to his owner always comes first. 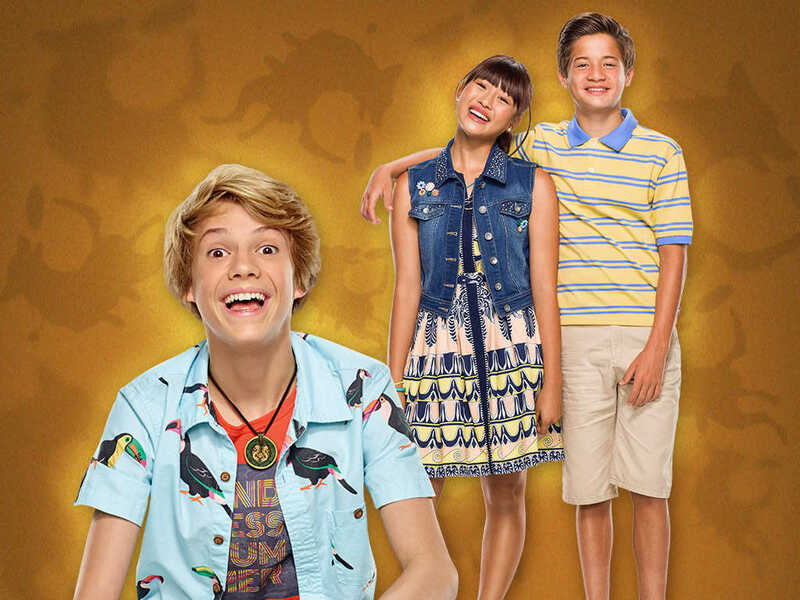 "Rufus", formally titled "Manny's Best Friend", stars Jace Norman ("Henry Danger", "Splitting Adam"), Haley Tju ("Bella and the Bulldogs") and Curtis Albright ("Liar, Liar, Vampire"). 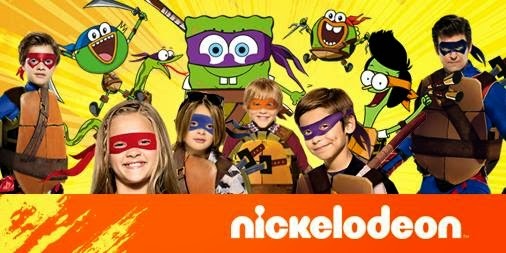 Nickelodeon UK is also expected to continue to premiere and show more brand new episodes of hit shows, including "Nicky, Ricky, Dicky & Dawn" (season two), "The Thundermans" (season three), "Bella and the Bulldogs" (season two), "Henry Danger" (season two), "Instant Mom", "Make it Pop" (season two), "Game Shakers", "100 Things to Do Before High School", and "Max & Shred" (season two), plus add more digital content to nick.co.uk and the award-winning Nick Play App in 2016, including "Chase Champion" and "Mr. Sheep's Department of Dreams". Nickelodeon's Heroes in a Half-Shell return when Nick UK's animation and action channel, Nicktoons UK and Ireland, starts to premiere and show brand new episodes from "Teenage Mutant Ninja Turtles" season 4, continuing the shell-raising crime-fighting adventures of the four mutant Heroes in a Half-Shell turtles — Leonardo, Raphael, Donatello and Michelangelo! 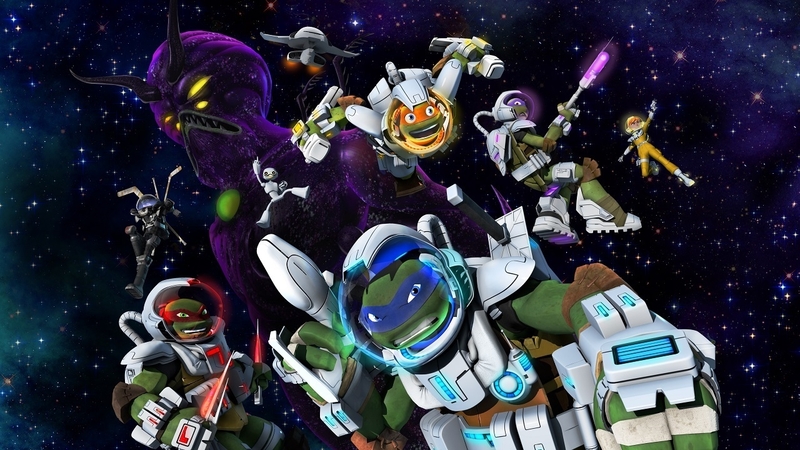 In the 26-episode fourth season of TMNT, the Heroes in a Half Shell will embark on their most epic adventure yet – outer space! The Turtles, joined by a cyborg known as Fugitoid, hurdle though space meeting strange and bizarre alien creatures and combat galactic monsters all in a race against time to save planet Earth. 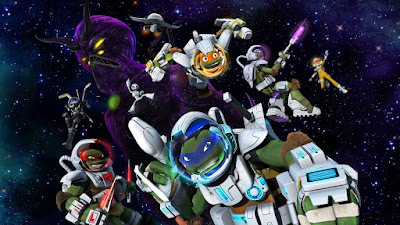 Suit up and strap in for a space-tacular adventure as Donny, Mikey, Leo and Raph gear up into totally awesome, new astro suits! "Teenage Mutant Ninja Turtles" season four will feature a list of out-of-this-world stellar guest stars, including David Tennant ("Doctor Who") as The Fugitoid, Peter Stormare ("Fargo") as Lord Dregg, Ron Perlman ("Sons of Anarchy") as Armaggon, Zelda Williams ("The Legend of Korra" and Robin Williams' daughter) as Mona Lisa, and Michael Dorn ("Star Trek") as Captain Mozar, the supreme Commander of the Triceraton Fleet. He is a cunning and brutal military commander who answers only to the Triceraton Emperor! The Teenage Mutant Ninja Turtles find themselves on the adventure of a lifetime when they accidentally time travel back to the Jurassic Era in "Half-Shell Heroes: Blast to the Past"! 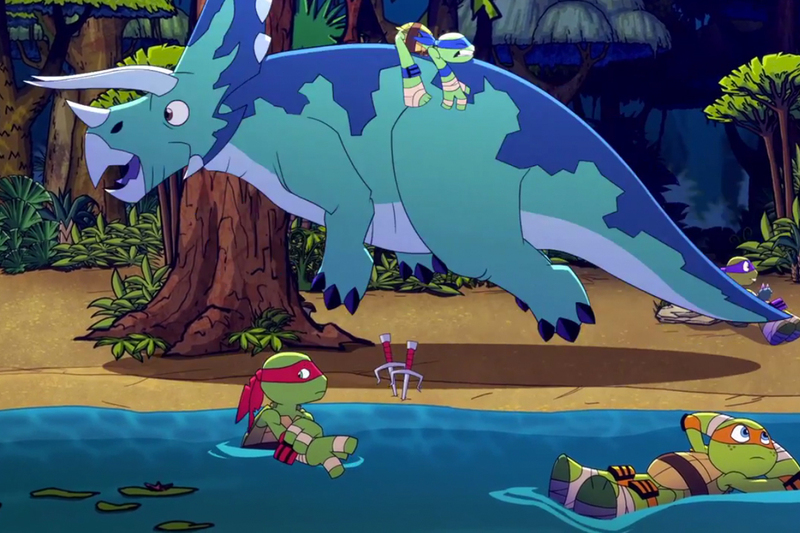 During the 2D-animated one-hour special, the Turtles encounter friendly dinosaurs from the past and dangerous aliens from the future who have a nefarious plan of their own. Using their ninja skills and having some fun along the way, the four brothers must find a way to save the day and get back to home. 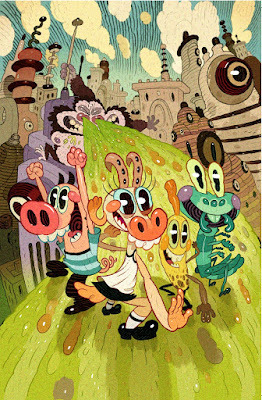 Inspired by first-time creator Chris Savino's ("Rocko's Modern Life", "The Powerpuff Girls") chaotic life growing up in a huge household, the series will follow 11-year-old Lincoln as he gives an inside look at what it takes to survive in the bedlam of a large family, especially as the only boy with 10 sisters. 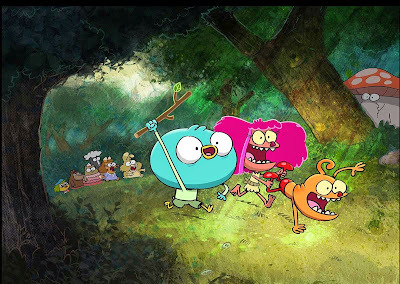 The series is based off a short of the same name from Nickelodeon's 2013 Animated Shorts Program, and will feature Nickelodeon Star Brian Stepanek ("Nicky, Ricky, Dicky & Dawn") as the voice of 'Dad'. "Pig Goat Banana Cricket" follows four friends nature never intended - a pickle-obsessed Pig, a Goat with musical dreams, a Banana who loves video games and a Cricket with a crazy science lab — in Boopelite City, a gigantic, fantastical metropolis unlike anything you've seen before; where fruit can walk, animals can talk, the sidewalks are crammed with animals, robots and sea creatures, and you can find all your pickle needs at the downtown Picklemart! The quad are roommates in a treehouse, which sits in the middle of the city, surrounded by the forest, seas and everywhere else the foursome could possibly go. 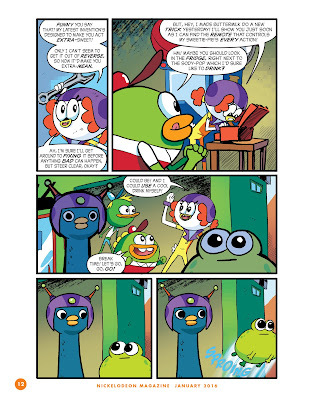 From surviving a fudge-pocalypse to challenging Prince Mermeow in the underwater city of Catlantis, Pig, Goat, Banana and Cricket often find themselves in sticky situations... but wherever these four friends go, they always know where they'll end up: TOGETHER! 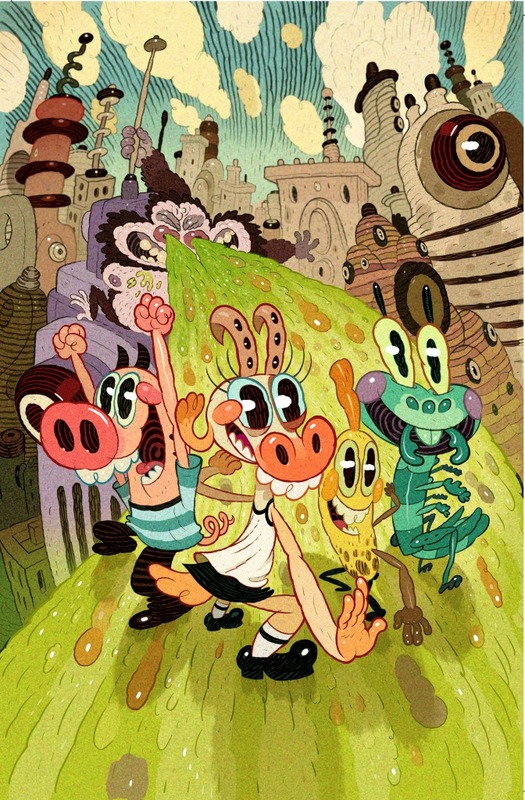 "Pig Goat Banana Cricket" is created by Dave Cooper and Johnny Ryan, established comic artists who worked on several issues of Nickelodeon Magazine, and executive produced by David Sacks ("The Simpsons", "Regular Show") who co-writes with J. Ryan. Dave Cooper also art directs the series and the pilot was directed by independent animator Nick Cross. 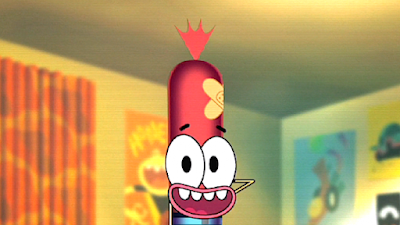 "Pinky Malinky" follows the everyday life of Pinky Malinky, an infectiously positive hotdog living in a human world who along with his two best friends, navigate school and life with a unique perspective. Their humorous experiences will also be shared across social media and Nickelodeon's digital platforms. "Pinky Malinky" is co-created and co-executive produced by Chris Garbutt and Rikke Asbjoern ("The Amazing World of Gumball") and executive produced by Scott Kreamer ("Kung Fu Panda: Legends of Awesomeness"), who are a part of the Artist Collective, an internal diverse group of experienced creators who mentor and support up-and-coming talent while also collaborating to cultivate, challenge and inspire Nickelodeon's development pipeline. The series is produced by Nickelodeon Animation Studios in Burbank, California. 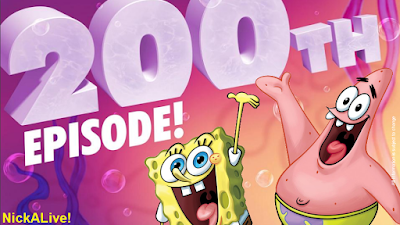 Nickelodeon megastar SpongeBob SquarePants will be celebrating the premiere of his 200th episode in style in 2016! News, views and football shoes - join Nick Kicks for your weekly round-up of all the latest from the world of football! Nicktoons UK is also expected to continue to premiere and show more brand new episodes of popular shows, including "Harvey Beaks", "The Fairly OddParents!" (season 10), "Sanjay and Craig", "Rocket Monkeys", "Breadwinners" and "Rabbids Invasion"! Aimed at the preschool audience, "The Day Henry Met..?" (26 x five minutes) is a brand-new 2D animated preschool series that encourages children to use their imagination and discover the world around them through play and adventure. In every episode Henry, a charming, inquisitive little boy, meets something new, which becomes the focus of his journey of discovery and adventure, ultimately teaching viewers about real-life objects and occupations. Henry always wants to learn and find out more, so in each episode, he has a friendly chat with whatever he meets - The Day Henry Met a Whale!, The Day Henry Met the Moon!, The Day Henry Met a Postman!, The Day Henry Met a Knight! Hmmm, I wonder what Henry's going to meet today? "The Day Henry Met..?" 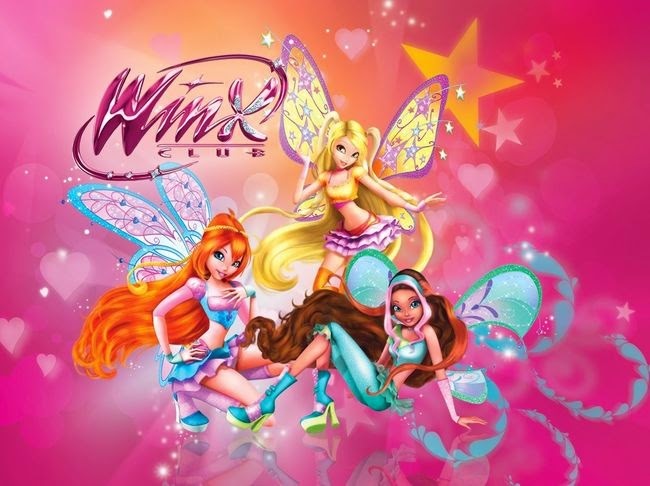 is produced by Irish animation company Wiggleywoo and is distributed by Dublin, Ireland-based Monster Entertainment. The series is funded by RTÉjr, The Irish Film Board, Section 481, Creative Europe and pre-sales. A second series will go into production in January 2016. 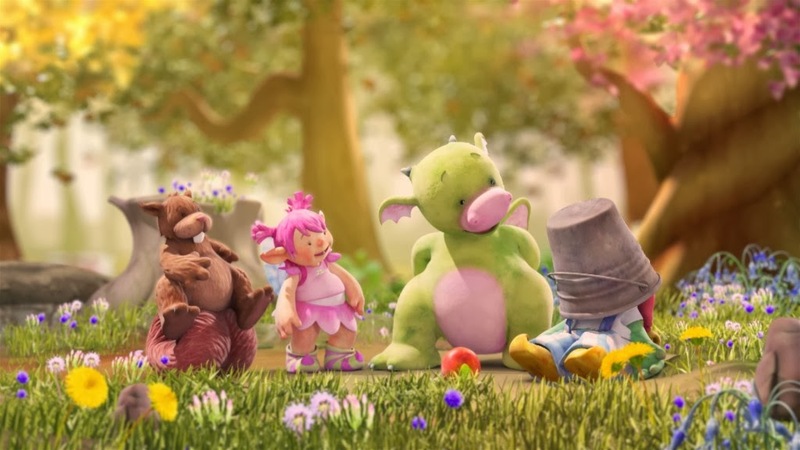 "Digby Dragon" is a brand new CG-animated preschool series set in the colourful and enchanted Applecross Woods that follows Digby a fledgling Dragon learning to fly. With his best friend, the fumbling, bumbling fairy, Fizzy Izzy, Digby takes on adventures in the woods encountering characters including train driver Grump Goblin and Chips, the scatter-brained Squirrel. "Digby Dragon" (26x30') is based on original work from Sally Hunter ("Humphrey's Corner"). Commissioned by Nickelodeon UK and produced entirely in the UK at Blue-Zoo Productions, the CGI show promises to be the latest in a long line of hits from the studio behind "Olive the Ostrich", "Tree Fu Tom", "Q pootle 5" and "Alphablocks". The series has been funded through an Enterprise Investment Scheme along with presales and advances. Nickelodeon & Viacom Consumer Products will represent Consumer Products for the property in the UK and Ireland, with Aardman Animations representing the property's international TV, DVD and digital sales. 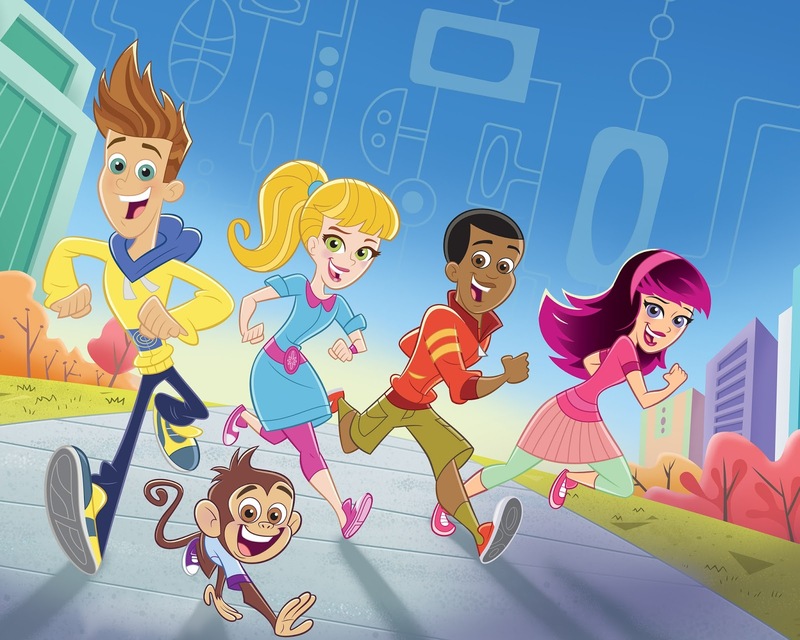 In this brand-new animated series (20 episodes) based on the hit live-action show, The Fresh Beat Band, the four best friends -- Kiki, Marina, Twist and Shout – are also a group of undercover spies. 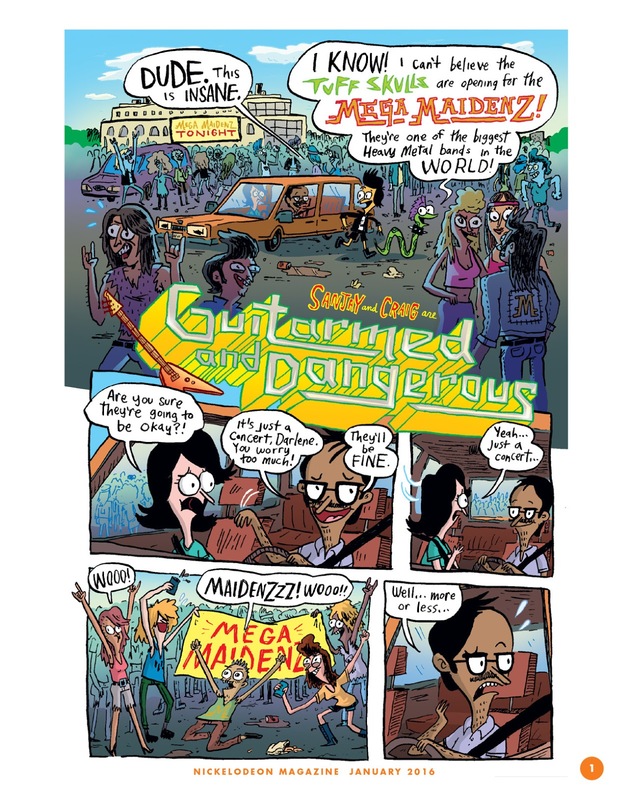 The pop band uses their individual talents and the coolest transforming spy gadgets to outwit a goofy cast of bad guys and solve an endless series of wild and wacky mysteries. 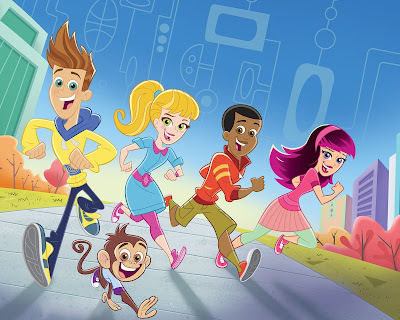 The series, which teaches problem-solving to preschoolers, is created by Nadine van der Velde and Scott Kraft, the same duo behind "The Fresh Beat Band". "Mutt & Stuff" is a brand-new inventive live-action preschool series created by TV legends Sid and Marty Krofft, and Bradley Zweig. 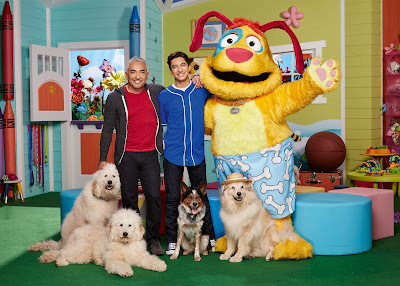 Set in a unique school for Dogs, the series stars Calvin Millan and his dad, Cesar, star of "Cesar 911" and former star of "Dog Whisperer with Cesar Millan", interacting with a cast of both real Dogs and puppets at a Canine school called Mutt & Stuff. In addition to adorable Puppies and unbelievable Dog tricks, the series balances moments of heart and comedy with a social-emotional curriculum that helps preschoolers with identifying and managing emotions, building interpersonal awareness and developing social skills. The show also carries a message of pet adoption and responsible pet care based on Cesar Millan's philosophies. "Mutt & Stuff" is created and executive produced by Sid and Marty Krofft ("H.R. Pufnstuf", "Land Of The Lost"), along with Bradley Zweig. Cesar Millan also serves as executive producer. The series follows Calvin Millan and his best friend Stuff, a larger-than-life Dog with a personality to match, as they take preschoolers inside the doors of Mutt & Stuff, a school for Dogs, to explore the daily lives of these canine companions. Each episode features incredible tricks, training lessons and high-spirited humor. With the help of 15 playful puppies and charismatic puppets, Calvin educates preschoolers on how to train and guide their Dogs, as well as showcase the friendship and loyalty that puppies can provide. Nick Jr. UK and Ireland is also expected to continue to premiere and show more brand new episodes of popular shows, including "Shimmer and Shine", "ALVINNN!!! and the Chipmunks", "PAW Patrol", "Lily's Driftwood Bay", "Zack & Quack", "Blaze and the Monster Machines", "Dora and Friends: Into the City! ", "Wallykazam! ", "Little Charmers", "Puffin Rock", "Lily's Driftwood Bay", "Thomas and Friends", "Bubble Guppies", "Dinosaur Train", and "Wanda and the Alien"! To Be Confirmed: The release of a UK version of Nickelodeon Preschools' popular Nick Jr. App and Noggin app! Get Set For 2016 With The "TeenNick Top 10 New Year's Eve 2015 Special"
It's the final day of the year, and Nickelodeon are going bigger, better and brighter than ever with the ultimate New Years Eve Party! "TeenNick Top 10" is celebrating all that was amazing in 2015 with some of the best music, moments and stars of the year! To get you ready for a fantastic 2016, Nickelodeon, Maxwell Jones and Morgan are putting the best performers of 2015 under one roof (plus one in the world-famous Times Square in New York City), including special performances from Dawin, Conrad Sewell and Amanda Dilks! Plus, be sure to practice your "Bop" and your "Superman" and everything in between, because Silento's gonna Whip and Nae Nae all the way to 2016! Tune into "TeenNick Top 10 New Year's Eve 2015 Special", tonight at 8pm (ET/PT), only on Nick USA and TeenNick! Plus, be sure to tune into Nickelodeon's TV premiere of the PAWsome movie "Zookeeper", tonight at 9pm (ET/PT), only on Nickelodeon USA! Sources: ToonZone Forums member kanc, TeenNick.com Blog, Zap2it TV Listings, Nickelodeon USA on Twitter, Nick Radio on Facebook. Follow NickALive! on Twitter, Tumblr, Google+, via RSS, on Instagram, and/or Facebook for the latest Holidays on Nickelodeon and TeenNick Top 10 News and Highlights! 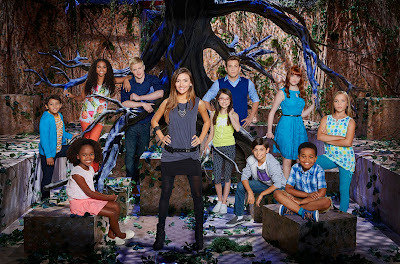 Root for Newt - "Bella and the Bulldogs"
Watch "Bella and The Bulldogs" on Nickelodeon and TeenNick! Additional source: Bella and the Bulldogs Wiki. Bring In The New Year The '90s Nickelodeon Way With "The Splat New Year's Eve Dance Party"
This New Years Eve, Nickelodeon USA is inviting viewers to bring in 2016 with a special '90s Nick Dance Party! Sources: Zap2it TV Listings, ToonZone Forums member kanc. New Years Day 2016 On Nickelodeon UK, Nicktoons And Nick Jr.
To celebrate the first day of a fresh new year, Friday 1st January 2016, Nickelodeon UK, Nicktoons and Nick Jr. have unveiled their New Years Day schedules, which are packed full of everybody's favourite shows, to make sure everyone can celebrate the very start of 2016 Nickelodeon Style! Check out Nickelodeon UK, Nicktoons and Nick Jr.'s slime-tastic New Years Day highlights below! NickToons UK and Ireland will be celebrating New Year's Day with a schedule packed full of episodes of "Teenage Mutant Ninja Turtles", "SpongeBob SquarePants", "Sanjay and Craig", "Breadwinners" and "Harvey Beaks"! Plus, there's more magic and mayhem in the "Fairly OddParents" special "Wishology" at 12:00pm! Follow NickALive! on Twitter, Tumblr, Google+, via RSS, on Instagram, and/or Facebook for the latest Nickelodeon UK, Nicktoons and Nick Jr. News and Highlights! 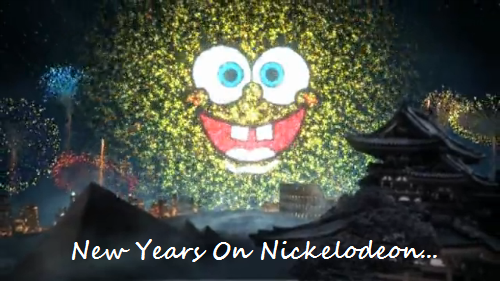 New Years Eve 2015 On Nickelodeon UK, Nicktoons And Nick Jr.
To celebrate the last day of the year, Thursday 31st December 2015, Nickelodeon UK, Nicktoons and Nick Jr. have unveiled their New Years Eve schedules, which are packed full of everyone's favourite shows and much more to make sure everyone can have a end of the year party Nickelodeon Style! Check out Nickelodeon UK, Nicktoons and Nick Jr.'s slime-tastic New Years Eve highlights below! NickToons UK and Ireland will be celebrating New Year's Eve with a schedule packed full of episodes of "Teenage Mutant Ninja Turtles", "SpongeBob SquarePants", "Sanjay and Craig", "Breadwinners" and "Harvey Beaks"! Plus, there's more magic and mayhem when Nicktoons' "Fairly OddParents" marathon, "The 12 Days of Christmas", continues from 12pm! Nickelodeon USA has announced the PAWsome news in their new trailer/promo that Nick USA will premiere the brand-new Nickelodeon Original Movie "Rufus" on Monday 18th January 2016! 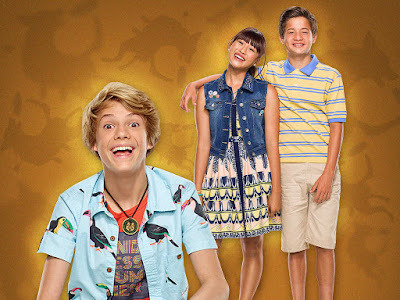 Nick.com's official "Rufus" website features information about Nick's all-new film, exclusive sneak-peek video clips, Nick USA's official "Rufus" trailer, character bios for Rufus, Manny and Paige, and Nickelodeon's official "Rufus" message board/forum, where fans can talk about Nick's new movie! Original source: ToonZone Forums member kanc. Follow NickALive! 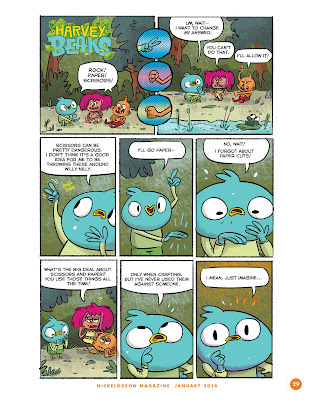 on Twitter, Tumblr, Google+, via RSS, on Instagram, and/or Facebook for the latest Nickelodeon and Rufus News and Highlights! To celebrate Nickelodeon USA starting to premiere and show "The HALO Effect", a brand-new docu-series hosted by Sydney Park ("Instant Mom") that profiles in every episode a young activist who is making a positive change in his or her community and inspiring others to do the same, on Monday 18th January 2016 at 8:00pm ET/PT, Nick.com has launched the networks all-new official "The HALO Effect" show website to accompany the brand new series, which you can visit here at nick.com/haloeffect! "The HALO Effect" series builds upon Nickelodeon's successful pro-social year-round initiative of the same name, which launched in 2013 and recognizes one deserving teen every month for their work to help and lead others in the community, with more than 20 teens across the USA to date being honored and receiving more than $100,000 in grants to fund their non-profit organizations, and Nickelodeon's annual "HALO Awards" concert special. "The HALO Effect" aims to inspire kids and teens to be active leaders in their communities by offering an insider's look at the incredible personal stories of kids who have used their passion and creativity to help those in need. Each 30-minute episode will focus on a ordinary teen who is doing extraordinary things by taking on issues ranging from poverty, to helping military families, to the environment, and will be capped by the profiled teen kicking off a "HALO Effect Challenge," an action or activity encouraging viewers to become a part of the HALO movement by giving them ways to Help and Lead Others (HALO) in their own communities. The first teen featured in "The HALO Effect" will be Jessica Collins, a 16 year-old from Shelbyville, KY. At the age of 10, she was inspired by the film "The Blindside", and the realization that there are kids who don't have a bed, to create "A Place to Sleep." With the help of her church, family and the generous contributions of local residents who donate funds, beds and their time, this non-profit organization has provided more than 700 families with bed frames, mattresses and bedding. 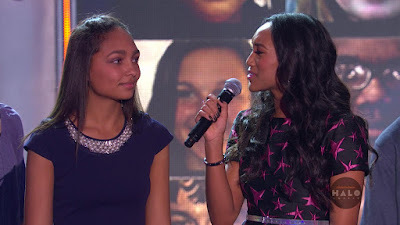 Nick USA's brand-new official "The HALO Effect" series website features information about Nickelodeon all-new show about its host, Sydney Park, and a super video in which viewers can get to know Jessica Collins, the first "HALO Effect" Champion, and her charity A Place to Sleep! "The HALO Effect" host Sydney Park is no stranger to HALO – that's why she’s the perfect host for "The HALO Effect"! This "Instant Mom" and "One Crazy Cruise" star first got her HALO on at the 2014 Awards in the epic Log Roll Challenge competition. Then she joined in recognizing all of the champions at the 2015 show. Now watch as Sydney raises her voice in honor of a whole new group of helpers and leaders. Sydney can next be seen in the upcoming independent feature film "The Standoff". "The HALO Effect" is executive produced by Nick Cannon and NCredible Entertainment, as well as Morgan Spurlock, Richard Arlook, Jeremy Chilnick and Ethan Goldman of Warrior Poets. Follow NickALive! on Twitter, Tumblr, Google+, via RSS, on Instagram, and/or Facebook for the latest Nickelodeon and The HALO Effect News and Highlights! To celebrate Nickelodeon USA premiering the brand-new "Miraculous: Tales of Ladybug & Cat Noir" episode "Copycat" on Sunday 3rd January 2016 at 12:00pm ET/PT, Nick USA has unveiled a super sneak peek preview of the all-new "Miraculous" episode, which you can watch in the fantastic online streaming video clip here on Nick.com! In the brand-new "Miraculous Ladybug" episode "Copycat" (#108), when Cat Noir becomes a burglary suspect, Ladybug must find a way to prove his innocence. 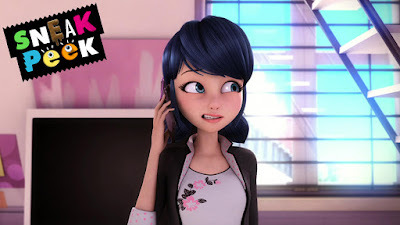 In the super sneak peek, "An Important Call", Alya helps Marinette call Adrien to ask him out, but she isn't exactly smoothe about it. I Got Sand In My Pants - "Rugrats"
2015 Best of Nickelodeon Vine Compilation - Try not to Laugh or Grin! Hey ho, let's go! To an awesome metal concert. 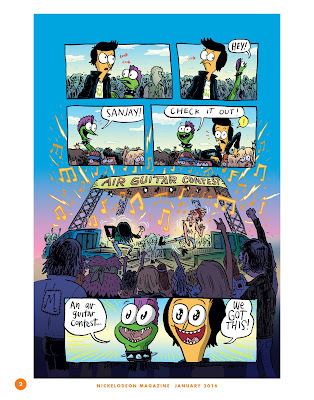 In the latest issue of NICKELODEON MAGAZINE (on sale December 28th), Nickelodeon cartoon stars head to a rockin' music spectacular. The Tuff Skulls finally get their big break, opening for the world famous Mega Maidenz. But when S & C enter an air guitar contest at the show, they shred so hard they literally blow the roof off the joint! What happens next? You'll have to pick up the issue to find out. Of course, if you're going to capture that true rock and roll spirit, it helps to work with artists who are as much a part of the scene as the music themselves. That's why Papercutz reached out John Holmstrom, cover artist for the legendary Ramones' albums "Rocket to Russia" and "Road to Ruin" and a co-founder of the groundbreaking PUNK Magazine. "My old friend (Papercutz Editor-in-Chief) Jim Salicrup reached out to me because he thought I'd get a kick out of this story. When I read it, I was reminded me of my own early experiences with rock and roll," noted Holmstrom, "So I was happy to contribute a piece that helped convey the fun and excitement of being in a band. And for the record, I think Sanjay and Craig are pretty punk!" Holmstrom is no stranger to comics , having created Bosko "America's least favorite cartoon character" and contributed comic stripo material to numerous publications including SPIN and HEAVY METAL. "John is an art and music legend," exclaimed Papercutz Editor-in-Chief Jim Salicrup, "and we're proud to feature his first national magazine cover. There's no doubt in my mind that when the Tuff Skulls finally get signed to major label, they'll be tapping John for some album cover art. Or iTunes art. Or whatever way kids will be interacting with art and music in the near future. No matter what the medium, John's talent will let them know, this stuff rocks!" 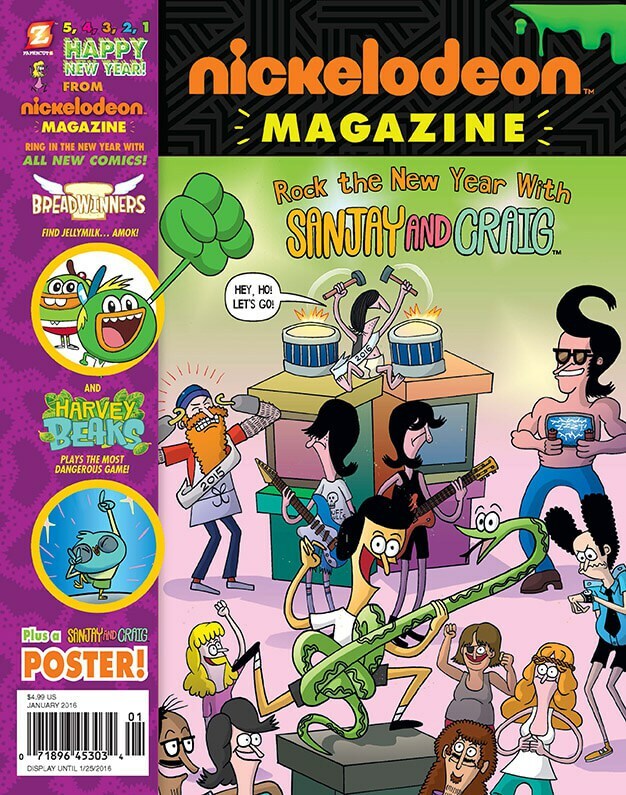 NICKELODEON MAGAZINE #7, featuring Holmstrom's cover and the Sanjay and Craig story "Guitarmed and Dangerous" is on sale December 28th at newsstands and bookstores everywhere. Additional source: Nickelodeon Animation Studio. Follow NickALive! 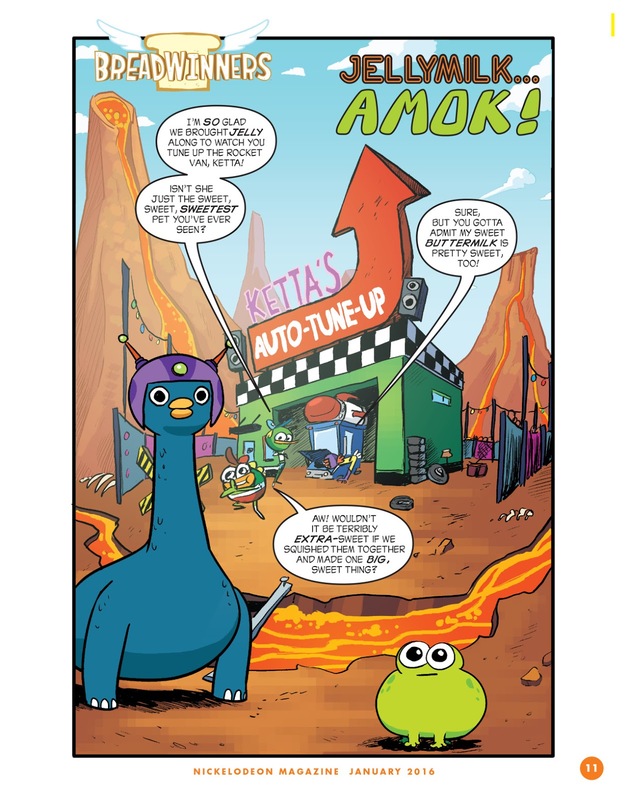 on Twitter, Tumblr, Google+, via RSS, on Instagram, and/or Facebook for the latest Nickelodeon Magazine News and Highlights! Variety is reporting that Viacom International Media Networks, which operates Viacom channels such as MTV and Nickelodeon around the world, has restructured its television business in Russia. VIMN has entered into a new partnership with Legacy Media so that the business complies with the amended Russian Mass Media Law, which will take effect on Friday 1st January 2016. The law sets the maximum foreign stake in Russian mass media companies at 20%. A new joint venture between VIMN and Legacy will operate the 12 pay TV channels in Russia which were previously owned and operated by Viacom International Media Networks (VIMN) Russia, CIS, Ukraine and Baltics alone. "Since entering the Russian market in 1998, VIMN's local operations have grown strongly with all four of its core global brands - MTV, Nickelodeon, Paramount Comedy (Comedy Central) and Paramount Channel - now firmly established," VIMN said in a statement. "VIMN and Legacy Media are committed to providing Russian TV viewers with the best in children's, comedy, music and general entertainment programming and film, and will continue to build on the strong recent performance of these brands." Follow NickALive! on Twitter, Tumblr, Google+, via RSS, on Instagram, and/or Facebook for the latest Nickelodeon Russia and Viacom International Media Networks (VIMN) News and Highlights! Nickelodeon UK Digitally Premieres First Episode Of "WITs Academy"
To celebrate Nickelodeon UK and Ireland and Nickelodeon HD UK starting to premiere and show "WITs Academy", a bewitching spin-off of "Every Witch Way" following Andi's magical journey at the prestigious W.I.Ts Academy, every Tuesday, Wednesday and Thursday at 6:00pm from Tuesday 5th January 2016, Nick UK has made the very first episode of "WITs Academy", "The New Guard", available to watch for free on the channels official "WITs Academy" show website and award-winning Nick Play app! Nickelodeon UK's brand-new "WITs Academy" series webpage features information about Nick's all-new telenovela-style drama series, character bios for Andi Cruz, Jessie Novoa, Luke Archer, Kim Sanders, Cameron Masters, Ruby Webber, Sean De Soto, Emily Prescott, Ben Davis, Gracie Walker, Ethan Prescott and Agamemnon, Nickelodeon UK's official "WITs Academy" blog, exclusive video clips and photo gallery's, a fantastic poll asking fans whether they'd rather be a guardian or a witch, and a magical "W.I.Ts Academy" application form game! Guess The Quad Quote - "Nicky, Ricky, Dicky & Dawn"
"Nicky, Ricky, Dicky & Dawn" are back in brand-new episodes, starting Saturday 9th January 2016 at 8:30pm (ET/PT), only on Nick USA! Follow NickALive! on Twitter, Tumblr, Google+, via RSS, on Instagram, and/or Facebook for the latest Christmas on Nickelodeon and Nicktoons News and Highlights! Visit NickelodeonParents.com for more Nickelodeon holiday papercrafts! Tommy Pickles and Chuckie Finster can go #2 and still be #1. And now, so can you! And now, introducing all-new Adult Diapers - why should kids have all the fun? If I Was Double G - "Game Shakers"
Catch brand-new episodes of "Game Shakers" every Saturday at 8:00pm ET/PT from Saturday 9th January 2016, only on Nickelodeon USA! New Friends - "100 Things To Do Before High School"
Follow NickALive! on Twitter, Tumblr, Google+, via RSS, on Instagram, and/or Facebook for the latest Nickelodeon Italy and 100 Things to Do Before High School News and Highlights! Ahead of his 20th Australian Open campaign, Lleyton Hewitt will headline the fourth annual Kids Tennis Day presented by Nickelodeon on Saturday 16 January at Melbourne Park. 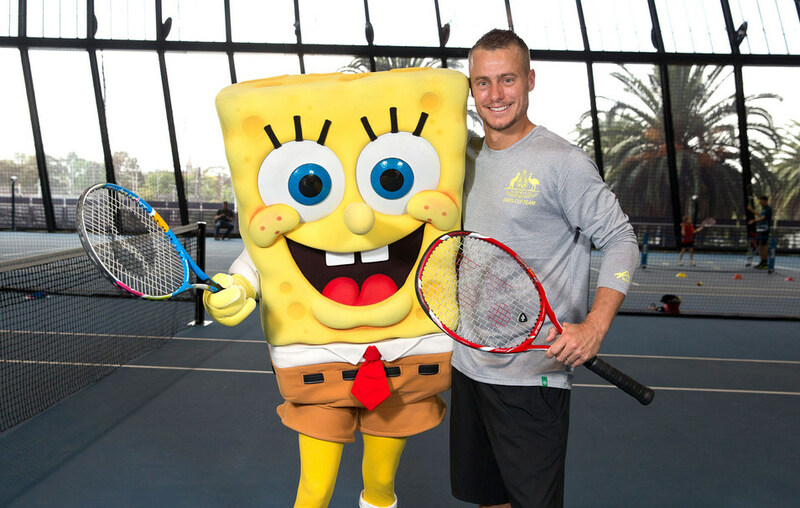 Hewitt will be joined by some of the world's best tennis players as well as Nickelodeon's SpongeBob SquarePants, Dora the Explorer, Teenage Mutant Ninja Turtles, Patrick Star and entertainers for some fun on centre court at the Rod Laver Arena Spectacular next month. Throughout the day kids will have the chance to experience tennis and play ANZ Tennis Hot Shots with qualified coaches, see Nickelodeon character stage shows, watch players practice and visit Grand Slam Oval ahead of the tournament's first day. "Kids Tennis Day is about engaging, introducing and educating the next generation about tennis and the Australian Open in a fun, relaxed way," Hewitt said. "I was fortunate enough to be involved in the game at a young age, receiving coaching, playing at a club and visiting the Australian Open every year. "I made a point of spending time around the practice courts watching the big names go about their business. It was fun and enjoyable and that is the best way for parents to approach their children playing, by making sure they enjoy themselves as it will help them to learn easily." Craig Tiley, Tennis Australia CEO added: "Kids Tennis Day presented by Nickelodeon is the country's biggest kids' event of the summer and it continues to introduce families to tennis. "In 2015 almost 14,500 fans attended Kids Tennis Day. It's a day that brings some of the greats of our sport together with the future generation to drive the message that tennis is a sport for life. It's all about picking up a racquet and having a go no matter what age or ability." Kids Tennis Day presented by Nickelodeon runs from 8.00 am to 1.00 pm on Saturday 16 January at Melbourne Park, home of the Australian Open. Tickets are selling fast via Ticketek. Kids under the age of 16 are FREE but will require a ticket to enter. Adults are $15. Ground passes will be available to purchase should the Rod Laver Arena Spectacular sell out. New for 2016, the Australian Open Festival at Birrarung Marr will feature Kids' World, open daily from 18 to 31 January between 9.00 am and 7.00 pm. Kids can experience Nickelodeon's giant inflatable playground, meet and greet characters and visit the world famous Slime Lab. The Woolworths Kids Zone will feature fun ballkid challenges plus kids will be able to pick up a racquet at the ANZ Tennis Hot Shots mini courts. Suncorp Kids Tennis Day returns to Brisbane International at the Queensland Tennis Centre on Sunday, 3 January 2016 with appearances by ROGER FEDERER and some of the world's best tennis players, performances by Aussie pop sensation AT SUNSET and live shows from Nickelodeon character favourites. From 9am – 1pm, kids can meet their favourite Nickelodeon stars including SpongeBob SquarePants, Dora the Explorer and in a world-first – experience the PAW Patrol live show and meet the characters. From 11am, the Pat Rafter Arena Spectacular will bring together players and Nickelodeon characters for some tennis fun, with an epic live performance by AT SUNSET, who will debut their brand new single, Kiss Me. "We love the summer of tennis and are super excited to perform our brand new single for the first time ever to Brisbane families! 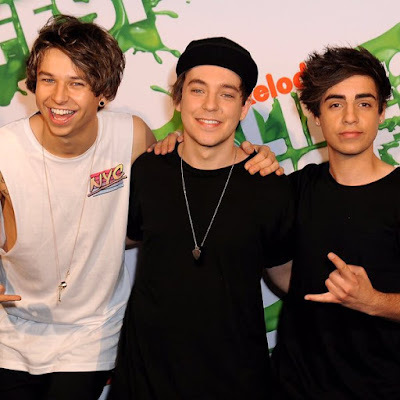 We're huge tennis and Nickelodeon fans, so can't wait to share the stage with some of our favourite stars – bring on the Teenage Mutant Ninja Turtles," said Harrison Kantarias from At Sunset. Suncorp Kids Tennis Day is an event that brings kids and families together to celebrate and share in the excitement of the Brisbane International tournament, taking place 3 – 10 January 2016. Throughout the day, kids will have the chance to play ANZ Tennis Hot Shots with qualified coaches and watch players practice ahead of the Brisbane International. Tickets are selling fast via Ticketek. Kids under the age of 16 are FREE with a full paying adult. Suncorp Kids Tennis Day runs from 9am to 1pm on Sunday, 3 January at the Queensland Tennis Centre. 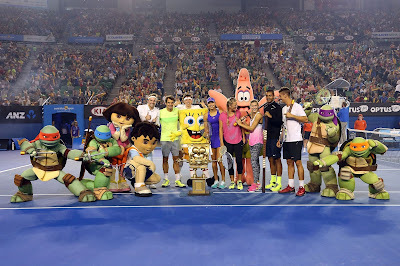 Nickelodeon will also launch an All Stars Tennis App to coincide with the Australian Open events. Kids will be able to test their tennis skills against characters such as SpongeBob SquarePants and climb the All Stars Tennis ranks from Rookie to World Champion. The app will be available to download on iOS and Android. Follow NickALive! on Twitter, Tumblr, Google+, via RSS, on Instagram, and/or Facebook for the latest Nickelodeon Australia & New Zealand and Teenage Mutant Ninja Turtles News and Highlights! SINGAPORE, 22 DECEMBER 2015 – Three best friends are determined to make the most out of their middle school years using an ever-expanding list of challenges as their guide in Nickelodeon's newest live-action series, 100 Things to Do Before High School, debuting Monday, 11 January 2016 at 5pm (TH), 6pm (HK/SG), 7.30pm (PH), 7.45pm (WIB) and 8.45pm (MY). The series will air regularly on weekdays. Click HERE for an exclusive sneak peek of the show. Created by Scott Fellows (Big Time Rush), 100 Things to Do Before High School follows the comedic adventures of 12-year old CJ Martin (Isabela Moner) who always dreamed that high school would be the greatest years of her life. After her older brother warns her that life after middle school is not quite the teenage dream, CJ becomes more committed than ever to strengthen her friendships with her two best friends, Fenwick Frazier (Jaheem Toombs) and Christian "Crispo" Powers (Owen Joyner), before high school ruins their lives forever. Together, they embark on a bucket list of adventures that help them overcome class cliques, terrifying bullies and clueless teachers. For CJ, Fenwick and Crispo, growing up means trying everything and taking chances while they still can. In the series premiere, "Find Your Super Power Thing!," CJ feels like she doesn't have any abilities or talents that makes her exceptional and teams up with Fen and Crispo to discover their "special thing." As CJ, Crispo and Fenwick work to find their talent, they realize mastering the things on "The List" is always easier with friends by their side. Scott Fellows created and executive produced Nickelodeon's hit TV series Big Time Rush, Ned's Declassified School Survival Guide and DHX Media's Johnny Test. Previously, he worked as a staff writer for the second, third and fourth seasons of The Fairly OddParents, and received an Emmy nomination for Outstanding Music and Lyrics for the show in 2003. Fellows' earlier writing credits also include episodes of Weinerville, U to U, 100 Deeds for Eddie McDowd and Doug. Follow NickALive! on Twitter, Tumblr, Google+, via RSS, on Instagram, and/or Facebook for the latest Nickelodeon Asia and 100 Things to Do Before High School News and Highlights! A Day In The Life Of Dale Whibley - "Make It Pop"
Yam Song - "Harvey Beaks"
Santa Explained by Grandpa Lou - "Rugrats"
Phoebe Vs. Max - "The Thundermans"
A Day In The Life Of Megan Lee - "Make It Pop"
Dr. Lipschitz - Supercut - "Rugrats"
A Day In The Life Of Erika Tham - "Make It Pop"
Holiday Hacks With Corki - "Make It Pop"
"Fan Song" - "Sanjay And Craig"
Double Date - "The Thundermans"
"Beautiful Christmas" - "Big Time Rush"